Pavers add elegance to any property. But just like anything else, they accumulate natural stains such as grease, grime, oil and pet and water stains. Other not so natural stains like tire marks, gum, paint and chemicals can add to the unsightly appearance. Left untreated, your property looks neglected. Paver cleaning in the Kansas City area must be performed on a regular basis in order to keep them looking their best. In addition to cleaning, a sealer protects the pavers, makes them easier to clean by making it harder for oil and grime to enter. 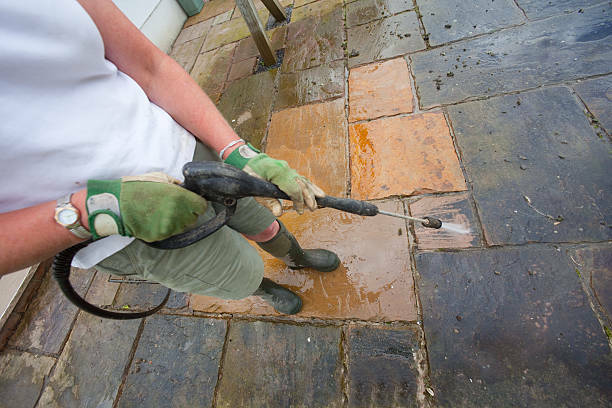 Southern Clean Pressure Washing has the experience to perform your paver cleaning with the proper environmentally friendly cleaning agents and correct water pressure and then finish with the right sealer to protect your investment. Whether you are looking for appearance, protective or stabilizing effects you need, there are different sealers to choose from to give you the look and results you desire. Give us a call today at (816) 434-0509 to discuss your pressure washing needs. If you need paver cleaning and pressure cleaning, perhaps this would also be a good time to consider a roof and house or building wash as well. Bundling services saves you money because we are already at your property. Our technicians are highly trained in the latest techniques to give you the best results possible. We are here to help and want to be your #1 choice in pressure washing!